When changing from a processed food diet to a Real Food diet, it is important for me to keep as many of our favorite meals as possible. I don”t want my family to give up because I am making too many changes all at once. Psychology (my minor in college) tells us that most people view change as a negative and I certainly do not want my family viewing nutritious and delicious Real Food as a negative. 1. I want to feed them the most nutrient-dense and delicious food possible. 2. I want them to learn to make good nutritition choices for themselves. My oldest son just finished his second year at Bowling Green State University. I’m very proud of all that he has been able to accomplish. I also feel like I’m running out of time with him. I need to make sure he goes out into the world understanding what a nutritious meal is. After all, I am his Mother. If I don’t teach him…………..who will? Thankfully, he is also my fellow foodie. He watched as much Food Network as he watched cartoons when he was young. When we first got our DVR, he filled it up with cooking shows. He is willing to try just about any food. However, he is not a fan of light meals. He prefers more substance. He is very much a meat and potatoes kind of guy. Perhaps, this will change once he quits growing. That should be soon, right? Alfredo has been one of his favorite meals for quite a while. On special occasions, I would purchase his favorite bottled Alfredo sauce and boil some pasta for him. He loved it! OK…….quit laughing all of you homemade dinner people. I’ve changed now. I now skip the bottled Alfredo aisle at the grocery store which I found was full of artificial ingredients and head over to the dairy department. I buy heavy cream and a block of Parmesan cheese. I make it all from scratch now. What I discovered is that making homemade Alfredo does take longer to make than dumping a bottle into a pan to heat up. However, it doesn’t take longer than waiting for the water to boil for my pasta. If I have time to boil pasta, I have time to make my own Alfredo sauce. 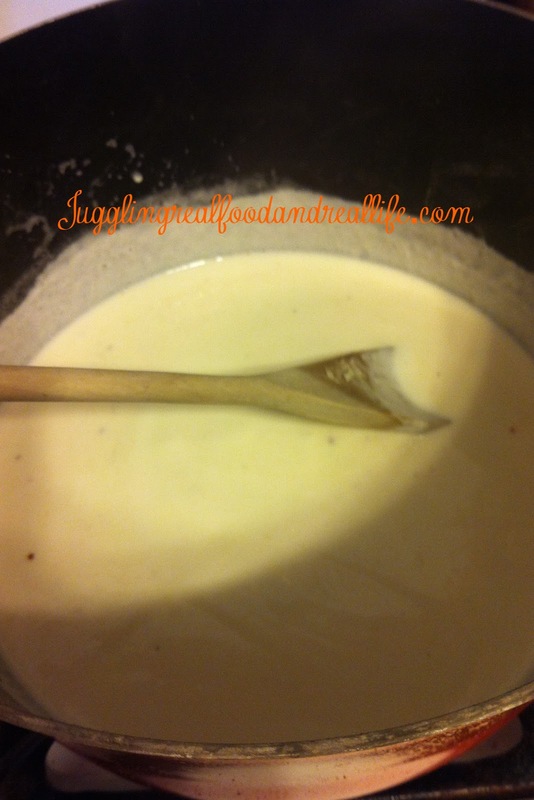 Here is the basic Alfredo sauce recipe that I use. I tried a bunch of different ones and then decided to stick with this recipe that I found at 100 Days of Real Food. I didn’t think it could be Alfredo without garlic so I added some to my dish. I will share in a future post, how I really jazz up this recipe to make it special. I usually double this recipe because I cook for a crowd and I like to have leftovers for lunches. Melt butter in a large saute pan over medium heat stirring with a wooden spoon. Add garlic. Saute for a minute. Add Parmesan cheese. Keep stirring. Add salt and pepper. Keep stirring. 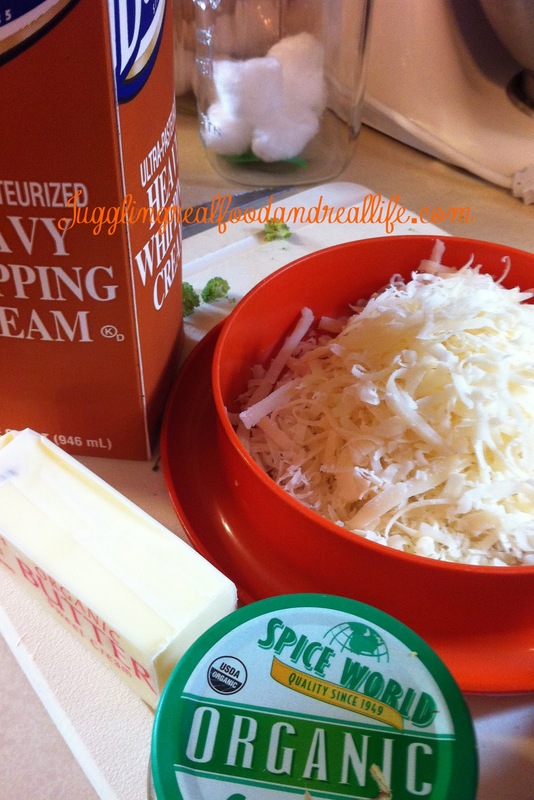 Stir until all cheese is melted and sauce thickens slightly. Do not overcook. Serve tossed with your favorite whole wheat pasta. We recommend organic ingredients where possible. Now it’s your turn………..Tell me what food goals you have for your family. 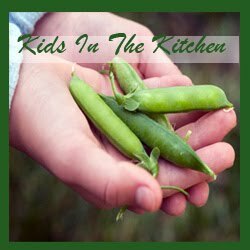 Are you able to get Real Food into your kids? Do you have picky-eaters or junior foodies? I would love to hear all about your families. Thank you for all of the love and support. Don’t forget you can join us on Facebook for more fun and support along the way. You can also follow us on Twitter @Jugglngrealfood if you are interested in learning more about the Real Food Movement. You can also follow our boards on Pinterest where I pin lots of delicious new recipes and fun activities for you family to enjoy. 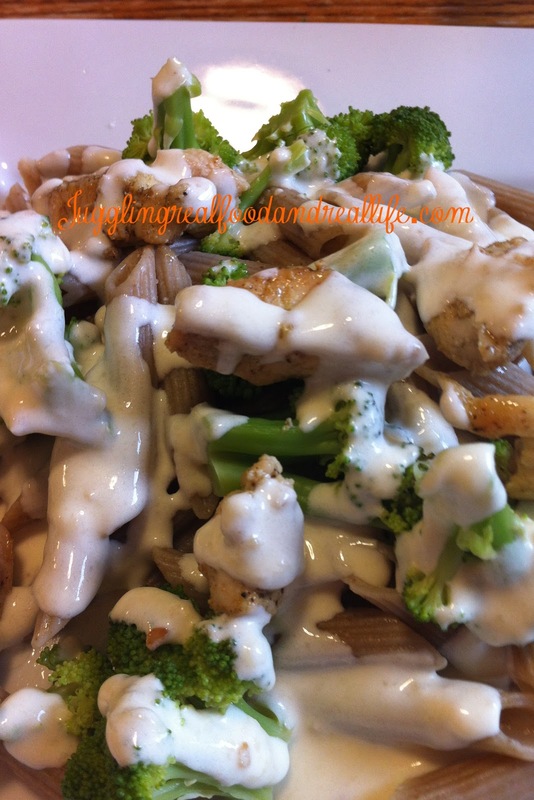 You might also like my Chicken and Broccoli Alfredo Pasta Bar recipe. Thanks for stopping by Leslie. I hope you come back often. I appreciate the invitation. Yum! I like to add a bit of cream cheese too! Thanks for liking mylampisfull on facebook. I returned the favor. Looking forward to more recipes. Hi Janine. Thanks for stopping by. I've tried the cream cheese too. I wasn't a fan, but that is probably because the rest of the recipe went horribly wrong. Maybe I should try it again. I hope you come back to visit often. We love alfredo sauce, thank you for sharing the recipe! I'm visiting today from Thursday's Favorite Things. Hi Rosey. Thanks for stopping back. Thursday's Favorite Things is one of my favorite places to visit. Mmmm love that full fat dairy! I've got some yogurt culturing right now! My kids are great about eating real food, although its hard for them to resist those horrendous doughnuts with sprinkles at church. Why do they serve that stuff anyway? Welcome Sarah! It's so nice to see your smiling face. I don't make my own yogurt yet. That's on the list to try soon. Any tips? I know what you mean about the donuts at church. I had to laugh at that. It doesn't matter if I feed the kids before church or not…….they want that treat. Arrgghhh! They are so good about their choices most other places. Welcome Sara! Thanks so much for stopping by. I hope you enjoy the Alfredo sauce. It is a favorite in our house. Now THAT looks yummy! Including in meal plan! Just made this for tonight's dinner and it was delicious. I've been using an alternate recipe that called for far too much butter. Your recipe is the perfect amount of everything. Thank you so much for posting! I'm so glad you enjoyed it as much as we do. I hope you come back to visit us often. Do you think this would freeze well? I'm trying to make personal size frozen dishes that could be heated by my husband on nights I'm at Bible study. You can freeze it. It does separate a bit which is easily fixed with a good stir. Mushrooms, diced tomato, and ham sounds divine…….especially with my sauce. LOL! I'll have to try that soon. The kids will think they are eating out at some fancy restaurant. YUM!!! Stopping over from Real Food Friday! I too used to buy the bottles but now I have gone without. Now that I know it's so easy I'll have to try your recipe. Thank you!!! It really is easy Mary. And so much better tasting when you use all fresh ingredients. Takes some muscle to get that parmesan grated. My arms are looking better, too. LOL! Had no idea Alfredo sauce was this easy to make. I don't ever want to buy it again! 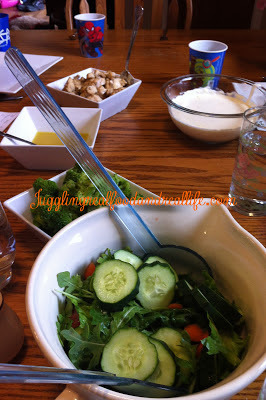 It's so great to see a blog centered around cooking real food. The first I think I've come across! Love what you are doing, Christina. Thanks for stopping by Amy. The Alfredo sauce really is easy to make and so much better for you than the jar stuff. Tastes better too! Real food just makes me feel better. I hope you come back to visit often. I'd like to invite you to join our site http://www.erecipe.com . 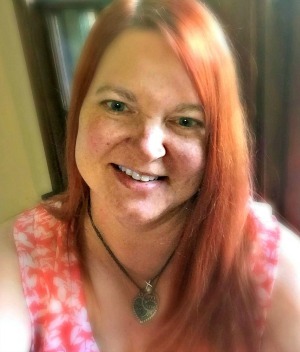 I really enjoy your blog and recipes and I think the over 8,000 unique daily visitors to eRecipe will too.